. 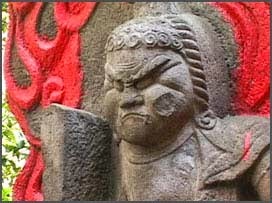 Yakuyoke Fudo 厄除不動 Fudo to ward off evil . 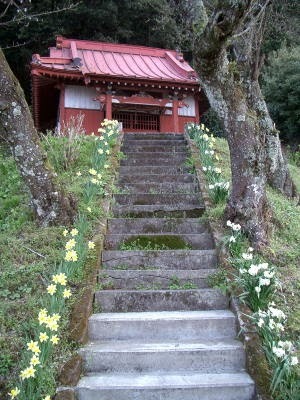 A temple of this name is located at the beginning of the ascent to mount Haguro San 羽黒山. Since old people, children and pregnant women could not climb this mountain, there was a second temple of this name in the town of Tsurugaoka built in 1166, where they could come to pray, especially to a statue of Kannon Bosatsu. 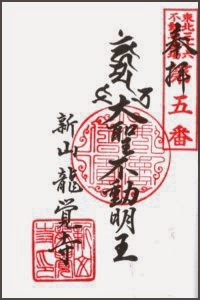 The temple has been relocated twice and in 1612 was placed in its present location at 高畑土提上. When daimyo Sakai Tadakatsu 酒井忠勝 (1587 - 1662) became lord of the domain in 1622, the temple was in the kimon 鬼門 direction of his castle. 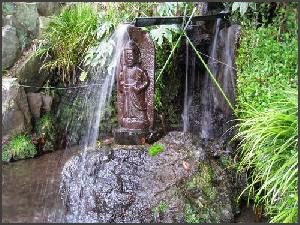 He also placed a statue of Fudo Myo-O to pray for peace in the reigon. There is also a Fudenji in Italy !! Miminashi Fudoo　耳無不動　"Fudo without ears"
This special mound for kesa priest's robes is in the compound of Mitsumine Shrine in Arakawa ward, Tokyo. 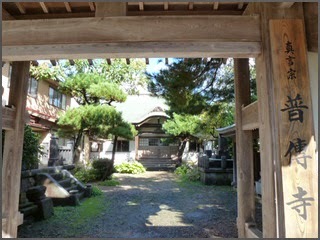 It used to be in the compound of temple Senkooin 仙光院 Senko-In. This mound has been built by priest Kooe 光慧法師 Ko-E of the temple 仙光院 Senko-In. Ko-E was involved with the pleasure quarters of Yoshiwara in Edo. 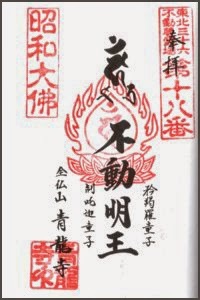 The story was even published "三河島御不動之記". 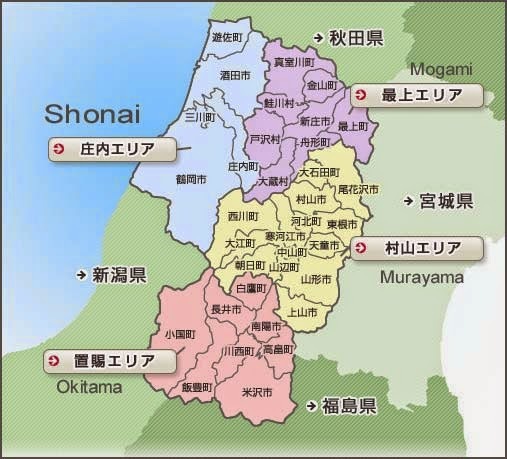 Ko-E was a samurai from Fukuoka, Yanagawa Han 福岡県柳川市. His name was Tana-Ami Kosaburo 田名網 光三郎. He had a beautiful fiance, O-Kinu お絹, but as life goes, she was seduced by 佐野兵馬 Sano Hyoma and taken to Edo with him. Kosaburo went after them to kill him (adauchi 仇討ち), but O-Kinu had already been sold to the Yoshiwara pleasure quarters. So the two could not meet again. 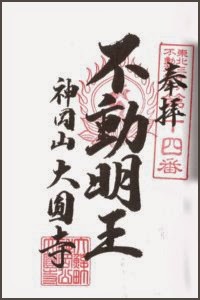 Kosaburo gave up normal life and became a Buddhist priest at temple 上野寛永寺 Kanei-Ji in Ueno, taking on the name of 光慧 Ko-E.
As life goes, he comes to meet the prostitute 紅山 Momijiyama, who was in fact his former fiance O-Kinu and begins to visit her frequently. He spent a lot of money from the temple Kanei-Ji and was dispelled from there finally. 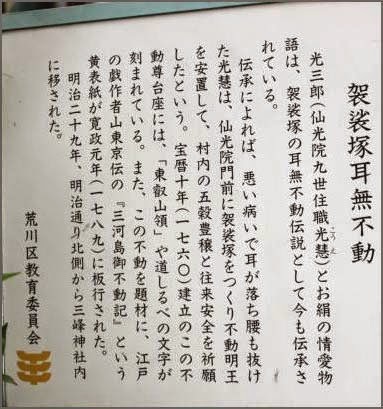 With the help of 植木屋久兵衛 Uekiya Kyubei from 三河島村 Mikawashima village (now part of Arakawa, Tokyo) he became the head priest of the temple Senko-In. By that time, Ko-E had already contacted a severe illness (maybe pestilence 悪疫 or a veneral disease? ) and his earlobes had fallen off. With a wish to be healed, he built a mound on the access road to his temple, called it Kesazuka 袈裟塚 and erected a stone statue of Fudo Myo-O. Even this would not heal his illness and he died in 宝暦7 1757. O-Kinu, who had become a Buddhist nun, followed him soon by stabbing her neck near a pine tree at the temple gate. In 1764 Tomoeya Densuke 巴屋伝助 from the New Quarters of Yoshiwara performed rituals for the souls of Ko-E and O-Kinu. From that time on, somehow, this Fudo had become known for healing veneral diseases (karyuubyoo 花柳病 karyubo "illness of flowers and willows) and many people from the pleasure quarters came here to pray. The statue of Fudo on this mound does not have the left ear. Now the statue is also venerated by people to cure ear diseases. People offer a wooden rice bowl with a hole to make their wish.
. kesa 袈裟 kasaya - Monk's robe .
. Amulets for Health .
. Mimi 耳 amulets for ears .
. Mitsumine Jinja 三峰神社 Mitsumine Shrine .
. miminashi Jizo 耳なし地蔵 Jizo without ears . Warts and problems of the skin are becoming a bigger problem in old age. 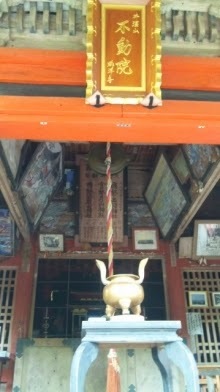 There are quite a few shrines and temples to pray for prevention or healing. Jizo Bosatsu いぼとり地蔵 is the most common of the deities to offer help.
. ibotori - take away warts . There are a lot of waterfalls in the mountains of this area. Once upon a time, there lived a young girl near the waterfall. She had warts all over the body. She had already seen many doctors and tried all kinds of medicine, but nothing would help. "Please try to pray to the Fudo in the pond of our temple!" So for 21 days (three times seven - 三掛ける七) she came every day barefeet and prayed to Fudo. "Today, throw some water of the pond on your body!" So when she woke up, she hurried to the temple and scooped a lot of water on her body. And what do you say ! all the warts disappeared suring this washing. Now she was a beautiful girl as ever there was one. 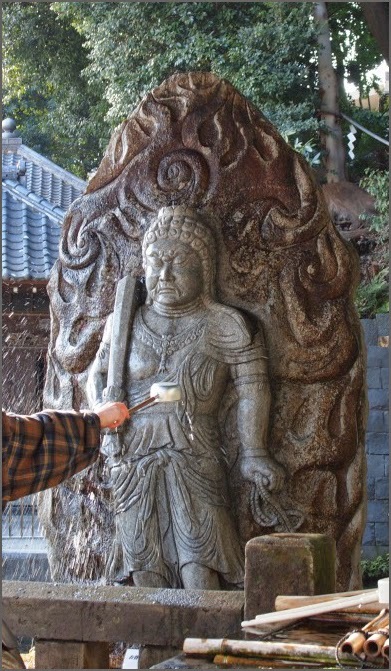 Since then people called the statue "Fudo who takes away warts" and prayed here. The water heals all kinds of diseases.